. . . DENA DeROSE . 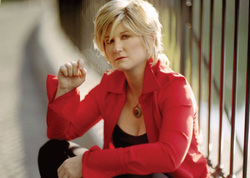 . .
. . . . TICKETS AVAILABLE TO SFMC MEMBERS FIRST . . . .
Dena DeRose, American Jazz Vocalist and Pianist, has recorded 11 CD’s as a leader with her latest on HighNote Records “We Won’t Forget You…An Homage to Shirley Horn” (May 2014). The CD received 4 Stars in Downbeat Magazine, nominated for Best Jazz Vocal album of 2014 by JazzTimes, and has had consistent airplay on US Jazz Radio Stations (including Internet Radio, Pandora, Sirius Satellite, etc) and has spent many months on the JazzWeek.com charts. This debut HighNote recording features her trio of 15+ years, Martin Wind (bass) and Matt Wilson (drums), and special guests Eric Alexander (tenor sax), Jeremy Pelt (trumpet), and Gary Smulyan (baritone sax). Dena’s much anticipated next release for HighNote is due out February of 2016. DeRose has been selected as an “Artist Deserving Wider Recognition” by the Downbeat Critic’s Poll in 2015, 2014, 2013, 2012, 2010, 2008, 2006, and 2003. All of her recordings have received 4 stars in Downbeat and 3 of her Maxjazz and her debut on HighNote recordings were considered for Grammy’s. Most recently, JazzTimes magazine included a feature article by Shaun Brady in the “Overdo Ovation” section on Dena in the Vocal Issue - December 2014. Dena has appeared on NPR’s Morning Edition, and was a guest on Marian McPartlands’ Piano Jazz three times including the 30th Anniversary show recorded live from Dizzy’s Coca-Cola Jazz Club (NYC). She has shared the stage with many jazz greats such as Clark Terry, Ray Brown, Kenny Burrell, Albert ‘Tootie' Heath, Benny Golson, Marian McPartland, Rufus Reid, Louis Hayes, Mark Murphy, Lewis Nash, Jay Clayton, Marvin Stamm, Michael Abene, Scott Hamilton, Benny Green, Harry Allen, Gary Smulyan, Jeff Hamilton, Matt Wilson, John Clayton, Terell Stafford, Tootie Heath, Larry Grenadier, Bill Henderson, Sheila Jordan, Peter Washington, Deborah Brown, Eric Alexander, Kenny Washington, Michael Abene, Jay Clayton, Bill Charlap, Akira Tana, Ken Peplowski, Ingrid Jensen, John Scofield, and many others. Dena has performed at some of the most respected Jazz Festivals around the world such as Marciac (France), Monterey (CA), The North Sea (Holland), Buenos Aires and Cordoba (Argentina), Providencia del Jazz (Santiago, Chile), The San Francisco (CA), The Red Sea (Israel), and world-renowned jazz clubs such as The Blue Note (NYC), Jazz Standard (NYC), Smalls (NYC), Jazz Alley (Seattle), Yoshi’s (CA), Montmartre (Copenhagen), The Widderbar (Zurich), Swing Hall and Body and Soul (Japan), among others. After residing in NYC for 15 years, DeRose moved to Europe when she accepted a Vocal Jazz Professorship at the Jazz Institute of the University for Music and Performing Arts in Graz, Austria (KUG). She continues to do concerts, clinics, workshops, and master classes around the world. Read More - www.denaderose.com.